I’m sharing my birthday cake with you today! I wish that I could share a slice with all of you but it’s physically impossible right now. (I’m sure someone is working on the solution as we speak, hehe.) 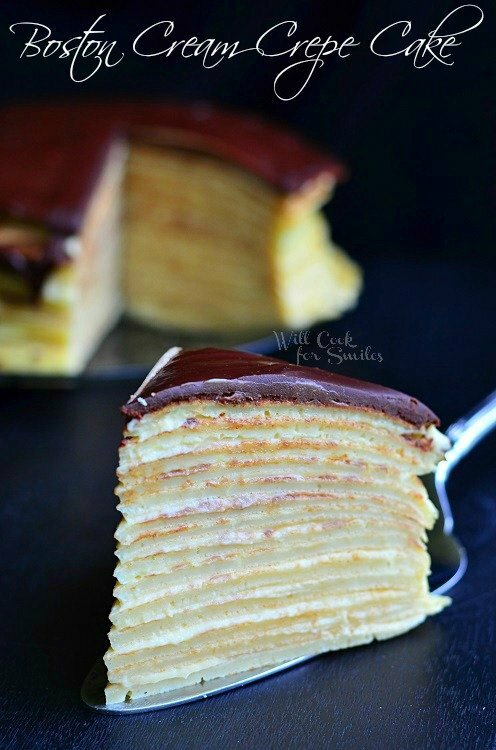 I’m sharing my recipe for this Boston Cream Crepe Cake, it’s a cake that has custard layered in between crepes and topped with ganache frosting. For the past couple of years, I’ve been making my own birthday cake. I know you will say “On, no, you can’t make your own cake!” But those who know me, know how picky I am. I don’t really like store bought cakes because they tend to make the soooo sweet that my teeth screech. My mommy used to always make my cake, but lately my birthday has been falling on weird days and I don’t get to see them on my birthday. So, I make own cake. It’s really a good thing since I love to bake and I get to be extra creative. I also put in extra thought into it since I am my biggest critic. I knew that I wanted to make something Boston Cream because I’ve been craving the custard and ganache flavors for a while. I’ve sifted through several cake ideas in my head and ran them by my husband. Since he’s been pretty good at coming up with ideas for baked goods lately, I went with the one he chose. The cake turned out amazing!! Consistency should be like melted ice cream!! Custard: Whisk together the egg yolks and sugar until completely combined. Add flour, whisk very well and set aside while heating the milk. Heat milk, heavy cream, butter and salt until simmering. Slowly add the heated milk mixture into the egg yolk mixture stirring constantly. Whisk well, slowly. Return the mixture into the pot and bring to simmer stirring constantly. The mixture will thicken within 30-45 seconds. Take off heat! Whisk in the vanilla, set aside to cool to room temperature. Crepes: Preheat a non-stick pan on medium high heat. Combine flour, eggs, milk, oil, salt, sugar and baking soda. Whisk all well. Slowly, start adding 1/4 cup of the hot water at a time to the batter. Whisking constantly until the batter reaches the consistency of melted ice cream. Pour about a ladle-full into the hot pan and swirl slowly. For this cake, I used a little bit more batter on each crepe and spread around to about 8-inch round crepe. (Normally, I use 1/2 ladle-full.) Cook for a few seconds on each side, until golden. Ganache: Bring the heavy cream to boil, be careful not to let it actually boil or it will raise. Pour the boiling cream over the chopped chocolate and stir until melted. Cool to a little warmer then room temperature. To assemble the cake: Spread a somewhat thin layer of custard on each crepe as you stack them of top of each other. Pour the ganache over the top of the cake. Refrigerate for a few hours or overnight to let the cake set. Ganache can also be poured on the cold cake, before serving. Remember to come back and link up to my party on Saturday morning!! 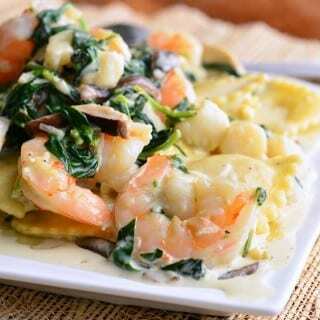 I will be sharing this recipe at the wonderful parties in my party tab + Weekend Potluck andRattlebridge Farm. Swing by and link up your own projects! Sure looks so wonderful! What a surprise to have when the little fellow got home from his first day at school! I love boston cream pie so this dessert is calling out to me. It is gorgeous and looks so yummy! About how many crepes do you end up with or aim to end up with? abut how many crepes should you end up with? I hope you had a fabulous birthday! I always make my own cake, so I can post it. My family doesn’t argue too much anymore. My husband would just buy one and, um, no thanks! 😉 OMG Lyuba, this cake is gorgeous! I’ve been dying to try a crepe cake, so I think I know what I’m making for MY birthday next month! Why would they argue, you cakes (and desserts) are awesome!! This looks awesome! I must make for my next occasion. Thank you! Oh, Lordy, this looks crazy good! 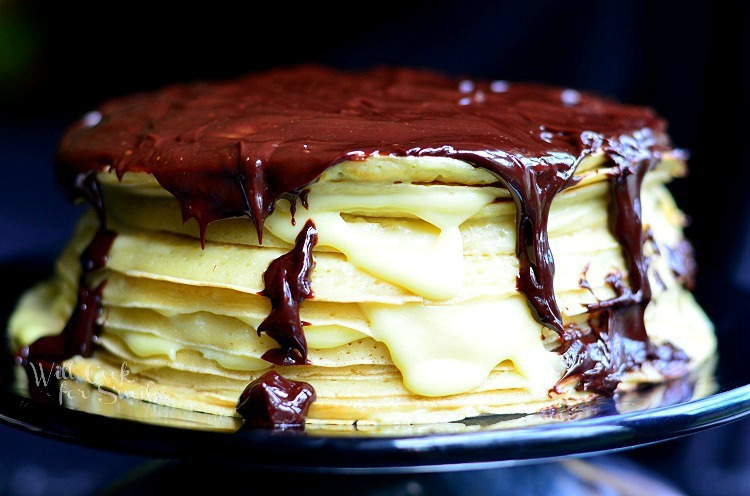 I love Boston Creme pie, and crepes all stacked up like that with custard in between look even better than cake. YUM! Sure is! Thank you so much, Marcie! Drooling!!! Happy Birthday and I hope you had a wonderful time! That looks amazing I love the idea of all that custard stacked in between the crepes. You are so talented. Happy Birthday!! Thank you so much, Jewel! WOW!!! Now that’s a dessert! Looks amazing, you are very talented!! Awww, how nice of you! Thank you, Lisa! Holy Crap look that piece of heaven!!! Seriously amazing! I’m going to go wipe the drool off my face now…. HAPPY BIRTHDAY! I’m not sure I’ve seen anything as beautiful, or delicious, as this! That is so sweet of you! Thank you, Suzanne! Lyuba! This is stunning! I love your cake. Happy Birthday! Thank you so much, Tonia! 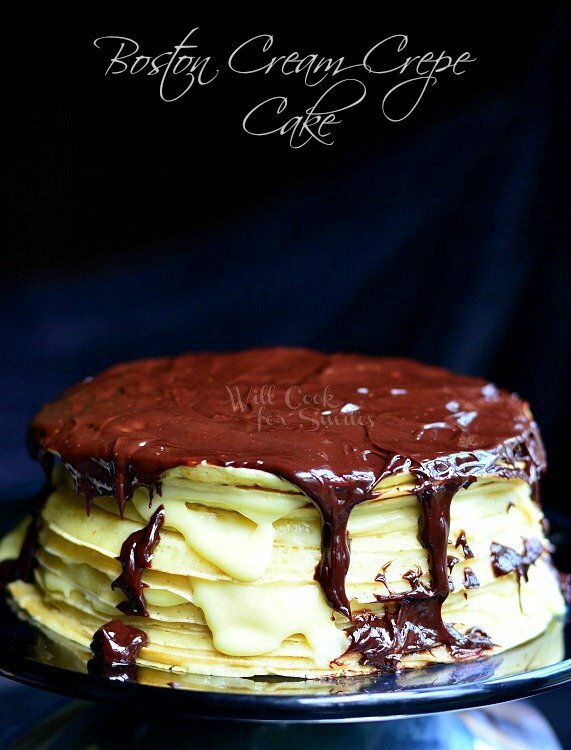 Ok this is just too much….. this crepe cake looks AMAZING!!!!! 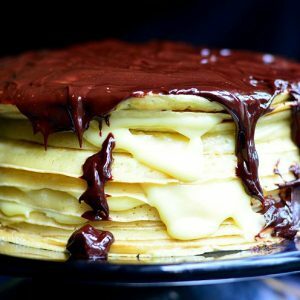 I love anything with the Boston Cream flavors, and I love crepes.. what a great idea to marry the two together! What a beautiful looking dessert! This is such a great idea and looks totally delicious. Happy belated birthday! WOW!!! That is an awesome cake Lyuba! The pictures are gorgeous and making me wish I had a slice…or two right now 🙂 No store could make anything even close to that! Yum! I made a chocolate meringue crepe cake and it was divine and this looks just as divine. I love the flavor the crepe gives the cake, not too sweet. I want to try this for my next crepe cake. Seriously, I’m drooling right now because it looks so good. Stopping by from the Inspired Linky. That’s why I really liked this cake, not too sweet! Chocolate meringue cake sounds awesome! OMG, Lyuba!! This is the most awesome birthday cake I have ever seen!! You are too sweet! Thank you, Cathy! Your cake looks absolutely heavenly. We made a crepe cake awhile back but nothing like this! Amazing! What a great idea! This cake looks wonderful! This cake looks great!! Happy birthday 🙂 and I make my own birthday cake too! This cake looks stunning. I can only imagine it tastes even more amazing! Hope you had a great day! Welcome, Amy and thank you for a sweet comment! Absolutely brilliant! I am so trying this! Now THAT is ridiculous, Lyuba!! Wow. Pinning now. Your pictures are amazing. I agree, you are so very talented!! Awww, you are making me blush! Thank you, Claire! That has to be the most beautiful cake I’ve ever seen, Lyuba! Seriously, I’m not exaggerating. Gorgeous! I am in awe of this recipe and the photos. What a fantastic job! You are too sweet, Andi! Thank you!!! This looks great and is a fabulous idea. I have to try it (I bet something similar with chocolate crepes would be great). It would definitely be great in a chocolate version! Thank you, Joybee! What a fabulous Birthday Cake, I would just love that Boston Cream Crepe Cake for my birthday. Hope you have a great weekend and thank you so much for sharing with Full Plate Thursday. I want to eat this RIGHT NOW. I will absolutely try this, THANKS for sharing!!! Hehe, thank you so much, Dorothee! This looks so delicious, totally irresistible!! Thanks for linking up with What’s Cookin’ Wednesday! Looks absolutely delicious! Happy Birthday! That looks delicious! Definitely going to try this. You you very much, Danita! Seriously, excuse me while I pick my jaw up off of the FLOOR! 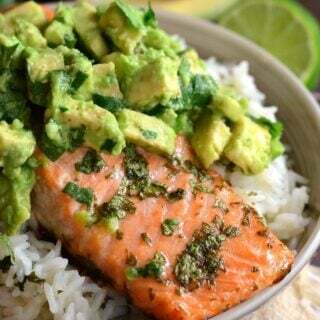 I wish I had the cooking ability to whip this up! DROOLING! You are so sweet! Thank you, Kylie! I seriously want a bite of this right now! My mouth is watering! Look at all those beautiful layers! Love it! I just love decadence at breakfast! YUM! We just added you to our link party list and hope you will do the same! 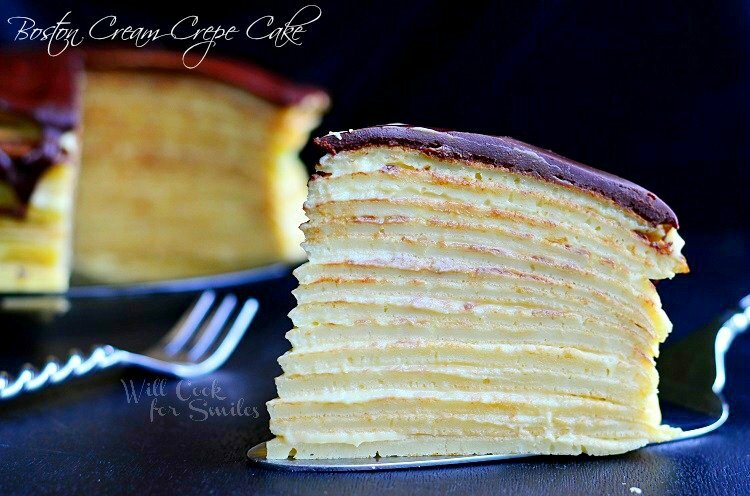 This crepe cake is a fantastic idea! I love crepes, and boston creme. What a smashing combo. Gives me some cake ideas of my own. I bet yours are better. Our weekly Super Saturday Link Party goes live every Friday at 8 pm at MadeFromPinterest.net. Wow! This cake sounds & looks amazing! Great photos too. Have a great day! What an idea! I love crepes, but I’ve never even heard of a crepe cake. Thank you again, Miz Helen! I am seriously concerned about the hot water amount for the crepes. I am making this right now and have used only 1 1/2 cups at this point, and it is already watery…..Can the amount be confirmed? Thanks.. The batter should be consistency of melted ice cream or a little bit thinner. Crepe batter is much thinner than pancakes batter, if that is what you are comparing to. Thin batter will make the crepe light and fluffy and thicken better will make it dense. I usually start with one cup and then add 1/2 a cup at a time while whisking. I do end up using about 3 cups of water. Awesome! If I made this it would never stay together like yours! Thanks for linking to Saturday Dishes! Come on over today – we’re talking eggs. Of course it would! Just make sure the crepes are cooled and the plate is level and not leaning. Pop it in the fridge and it will stay put as it cools! Wow, this looks amazing. Saw it on Nifty Thrifty Things and am pinning it now. Can’t wait to try it! great variation of the crepe cake! Oh. My!!! This is so beautiful, I am not sure if I would even want to demolish it! I’m no baker, but I would love to try this recipe out for sure! Thanks for the awesome dessert! I have made savory crepe stacks for a main dish but never thought of making a cake. This is awesome. My son and husband will love it. Week! I am almost out of batter and I only have made eight creeps! Well, I did have one that didn’t come out of the pan right so I ate it for breakfast! I will have to make another batch of batter or end up withi a verrrry short stack. What size pan did you use? Maybe mine is bigger. My finished crepe is 8.5 “. Judy, I used an omelet size pan. The crepes were about 7- 7 1/2 inches. I definitely got about 20 crepes. Your batter is not too thick, is it? Should be the consistency of melted ice cream. Boy, do I hate Auto correct! I should ALWAYS check before hitting send. I guess this time around, my son will have a Boston Cream pie height cake! He will love it anyway, I’m sure! That’s true, Judy 🙂 It’s not the size that will matter here! Hope you both enjoy it! Hi Gail. I honestly don’t know what would happened if you froze this. I’ve never frozen custard before so I’m not sure what it would be like after you defrost it. The cake might fall apart due to extra moisture. Just finished making the cake for my husband, and it turned out awesome! Such a great recipe, thank you so much! I definitely didn’t use more than 3 cups of water for the batter. We’re having a birthday breakfast party tomorrow morning, and this will be a real treat. Sorry to get back to you late (backed up in emails a bit)! I’m so happy that you liked it! Happy, Happy Birthday! Good for you for making yourself a Birthday Cake; I love your take on and old classic! Thanks so much for sharing, I love your recipes and will try this one soon. Awww, thank you so much, Rhonda! This cake looks amazing! I was considering making this for my Food Studies class and i was wondering how long this took to make? People feel bad for me too but I like to make my own cake! 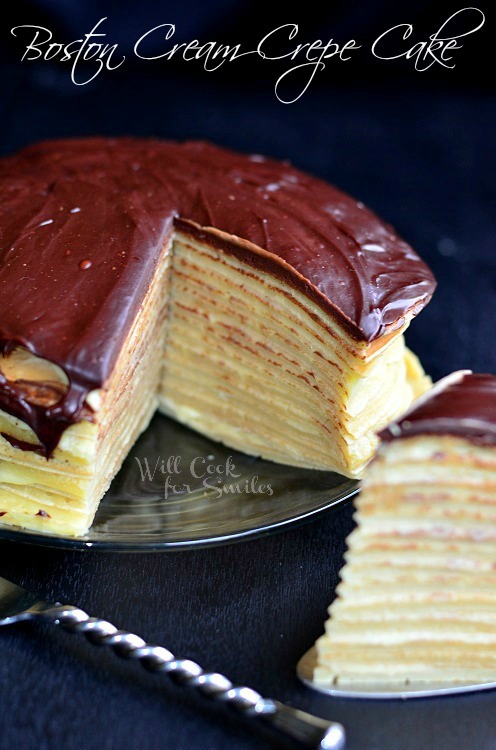 Boston Cream Crepe Cake….Whaaat?! SHUT THE FRONT DOOR! I need this in my belly SOON, Lyuba! 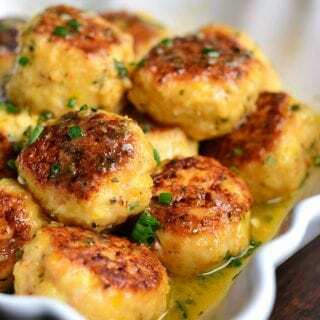 Hi Lyuba, I have to thank you for yet another knockout recipe. I made this birthday crepe cake for a friend this past weekend. He is a lover of crepes & Boston Creme. It was a bit of work getting it all together, I would change the order of some of the instructions slightly. Once you have everything prepared, it comes together really quickly. The cake cuts beautifully & looks spectacular on the plate-mine looks just like your photos. It tasted so good, the custard was perfect and soaked into the crepes a bit. The chocolate is not too sweet which works with the custard & crepes. My husband said, “you nailed it!”. The crepes have kept their texture despite being in the refrigerator for 2 days..it gets even better the next day. What a beautiful, comforting, familiar but different cake for a special occasion. My first attempt at crepes…a delicious success! Thanks Lyuba! I am a fan! Thank you for such as nice comment! I made the crepe cake as per recipe and it was awesome!!!! The only thing is that I did not have enough of the custard filling for all the layers. I improvised by intercalating custard and Nuttela as filling. Great recipe. Thanks! It sounds great to add Nutella! Hey! This cake was a great idea. Could you tell me why do you need to add the boiled water to the crepe batter? I did it the first time, then didn`t really know why and the second time I just used water straight from the tap, and I really didn`t notice any difference in taste or texture. I made my crepes really thick and only got 9 crepes, but in my opinion it was just enough so that I had enough filling. Boiled water was my grandmother’s secret to a beautiful crepe. It helps the crepe to cook with a pretty pattern. It also makes them softer. Ideally, crepes should be as thin as possible, that’s why the batter is runny. But if you liked them thick for the cake, it’s really up to you! I will definitely try the zest next time! Thank you! 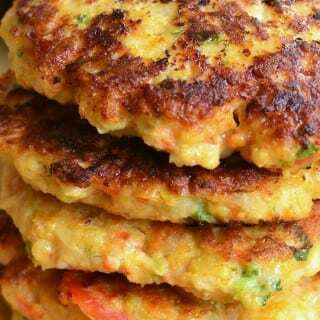 I will try it today, for a meal with my friend tomorrow, and than I post the recipe on my blog, with all the reference and link of your. Thank you so much, Francesca!! GOOD LUCK! Even though I grew up on metric system, I’ve forgotten it all. I know there are several nice websites that help with conversions. I hope it comes out well! Yet another frequent worry concerning how herpes is usually distribute requires the herpes virus spreading to other the different parts of your body. I’m so sorry that you had trouble with the cake. I’m not sure why you didn’t have enough custard as I had enough for the cake and even took a few bites. To me, using only 2 1/2 cups of water would make crepes a bit too thick but if you like them thicker, that is a personal choice of course. I’m sorry you had trouble with ganache as well. 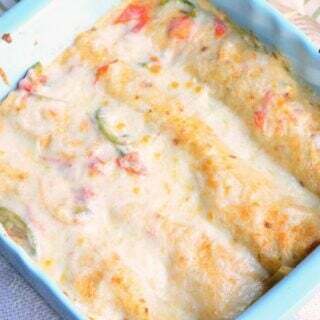 I prepare this recipe quite often and it is always nice and thick and cooling it completely WILL solidify it to the state where it will not spread on its own. I can’t really tell what went wrong as I wasn’t there with you but I do hope that it won’t give you trouble next time. Just made this and it looks exactly as it appears in these photos. The crepes turned out fantastically. the boiling water step is important. you can substitute the whole milk in the custard with other recipes if you don’t have any. I forgoed the entire custard in this recipe for an alternate recipe. The cake slips and slides so the kebab sticks are practical. Looks wonderful!! I’m wanting to make this in petit fours form, but I’m wondering if-recalling the texture of crepes- it might turn out sort of.. ‘Noodly’ with the crepes soaking up liquid like that. What was the texture like for you? Is it only good served fresh? Thanks! I think I know what you are asking and in a petit four form, it might just slide a bit easier. Cream is not very thin, so the crepes won’t soak up the cream but they will get softer from it. It is actually better if refrigerated overnight, rather than warm. What you can do for petit four pastries is insert a toothpick in the center of each, after constructing it, refrigerate overnight and then take out the toothpicks. I really hope this helps! I’m confused as to what the boiling water is used for. These crepes did not work on any level when I attempted to make them. They stuck to my nonstick pan no matter how much cooking spray or butter I coated it with. They were impossible to flip, when I was able to get them unstuck; flimsiest crepes I have ever tried to make. I’m sorry it didn’t work out for you! Crepes are supposed to be very very thin, so “flimsy” is probably the right way to describe them. I don’t know what to suggest about the pan because these crepes is something I make about every other week or all kinds of different pans. Be it cast iron or non-stick. I could only suggest checking the pan. Or did you use stainless steel? Sorry the recipe didn’t work out for you! First off the cake looks incredible! I just finished making it. I just have one question. My chocolate sauce is really runny and I followed the recipe to the dot. How ca I thicken the sauce next time? I’m sorry the sauce is runny! Did you use baking chocolate? I noticed that I didn’t specify that and I will fix it. Another thing, cutting heavy cream in half. 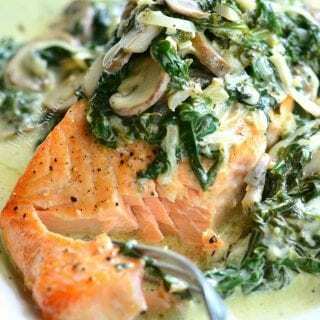 Mix in 1/4 cup of heavy cream first and if you feel like it could use a little more, Add a couple more tablespoons at a time. Can anyone tell me how much batter to put in the pan to cook the crepes for the Boston Cream Crepe Cake? The recipe says a ladle full. My ladles are many different sizes, and I am completely unfamiliar with Crepes, so can someone tell me a measurement I can use? Thanks so much!